We are often asked “when is a good time to put up a bluebird box”? Every day is a good day to put up a bluebird box. After all, the sooner they have a chance to see it the better. Fall is a particularly good time to put out a nest box because bluebirds often show great interest in boxes at this time. Many people that had successful nesting bluebirds will see them return to nest boxes in the fall and actually go through some of the motions of courting and nesting. Sometimes they will even put nest material in a box. What you are seeing is probably just a bonding behavior, not nesting. Perhaps a successful male and female pair from the previous breeding season is back to stake an early claim on the box, or maybe a male showing a potential new mate a good nesting spot. So, if you want to get a head start on attracting bluebirds now is a great time to put up a bluebird box. Now is also a good time to do a little maintenance on existing bluebird boxes. It’s a good idea to clean out the old nest material now so it doesn’t attract insects that can be a real danger to developing chicks next spring. November 11th through 16th take 20% off all Bluebird houses and bluebird house poles. And don’t forget the mealworms. We stock mealworms all winter long and as harsh winter weather descends upon us Bluebirds will be very appreciative of the protein rich larvae. Bluebirds will accept a variety of foods around the feeding stations during the winter months. Suet and shelled sunflower are the two most notable. I have seen them at tube feeders as well as platform and hopper feeders for shelled sunflower, and for peanut butter suet at a hanging suet feeder. All you Bluebird enthusiasts listen up! The Tennessee Bluebird Society is looking for new members. 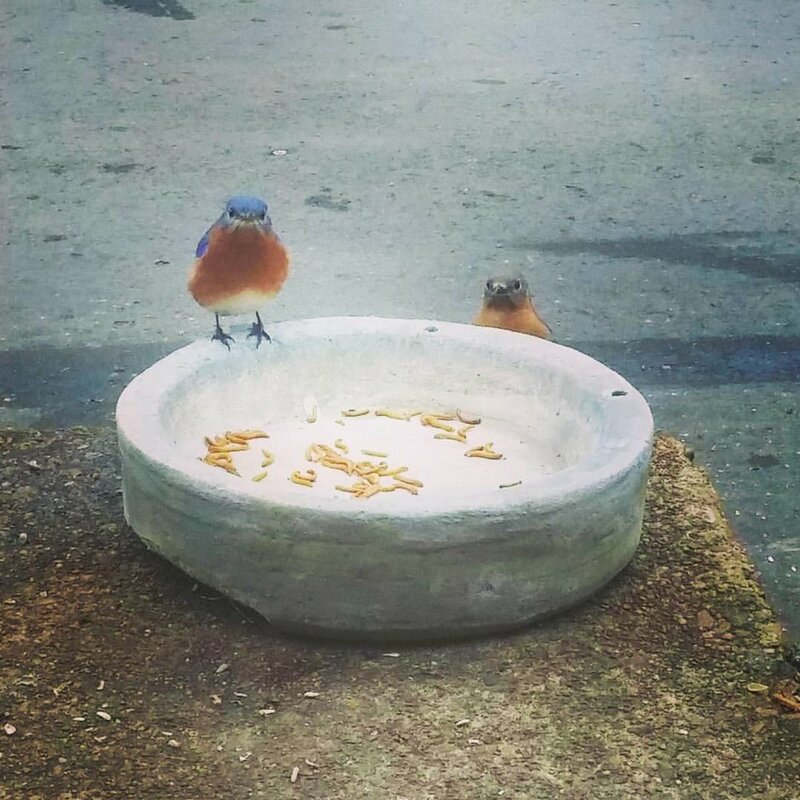 If you have a strong interest in and would like to help protect the Eastern Bluebird, and other native cavity nesting birds in Tennessee, the TN Bluebird Society would love your help. Please visit their website, tnbluebirdsociety.org. The Wood Thrush Shop is a proud member and supporter.